I came out of retirement to serve as interim pastor of State Line United Methodist Church on January 1, 2019. Having received my calling to ministry at the age of 45, this is my third career. I graduated from Evangelical School of Theology in Myerstown, PA in May of 2003 with a Masters of Divinity and have served in many capacities with the UMC. I enjoyed many years as pastor at Marion First UMC, as well as On-Call Chaplain with Chambersburg Hospital. I was born in Gettysburg, PA and currently reside in Chambersburg with my wife, Bea. We have three children and six grandchildren with whom we spend much of our time. In retirement, we have enjoyed traveling, visiting with family and visiting numerous churches of varied denominations. In 15 months, we attended worship services in 42 different churches and experienced the Holy Spirit moving in each one! I am excited to experience the energy of the mission and ministry here at State Line UMC. When I do eventually return to retirement, you will find me outside. I enjoy hiking, camping, hunting and fishing. The Church has always been a large part of my life. My mother taught the adult Sunday school class in our little church in Maplewood, PA, where my grandparents were both leaders. I come from a large family of five brothers and two sisters. I can remember walking about a mile to church. Sometimes, Dad would drive us in the surrey pulled by our team of horses. My husband, Harold, and I have been married 55 years. We are parents of four children, grandparents of six and great-grandparents of two. I enjoyed being a pastor’s wife for more than 30 years, working in little churches wherever needed and caring for our family. Our youngest daughter, the little “miracle” who God put in our lives, has taught us many things, especially about the power in prayer. After hearing a sermon from our District Superintendent about some churches lacking a pastor, I talked to her about being called to ministry. I began the process of becoming a Licensed Local Pastor, went to licensing school in Lewisburg, PA, and graduated from Wesley Theological Seminary in 2003. 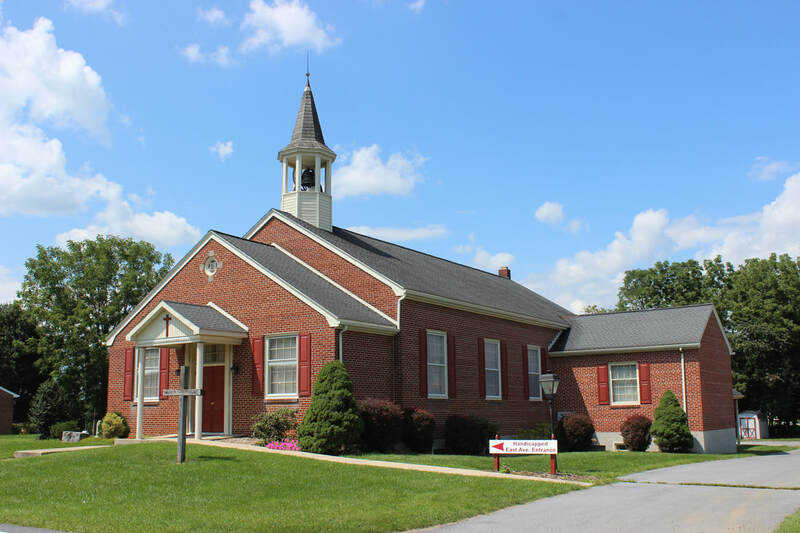 I have been privileged to serve as Pastor of St. Paul’s UMC in Mifflinburg, PA; Qunicy UMC in Quincy, PA, and the West Antietam Charge working full-time, with my husband as part-time Associate. I have been serving in the role of Administrative Assistant since August 2016. Before coming to State Line UMC, I had previous experience in emergency travel assistance, corporate training and human resources. I met my husband, James, at Mount St. Mary’s College in 1992 and we were married in the college chapel in 1998. We have two children who are active in sports, music and the church our family attends. As a parent of a special-needs child, I find enjoyment in renewing activities like running, walking and yoga. When I have the time, I make stained-glass windows for my family and friends. This job has been a wonderful addition to my life. I enjoy seeing the friends I have made in this congregation, helping out on projects and praying with the Thursday morning Bible Study group. I started playing the piano at the age of five! Although I only took lessons for a few years (from my mother, Bonnie), I stuck with it and eventually began playing in church and school. As a teen, I served as piano accompanist for my high school show choir, which gave me the opportunity to perform at Disney World! I then played the piano in college for a few years. Since then, I have played for weddings, banquets, musicals and currently play with the Williamsport Ambassadors Jazz Band. Prior to coming to State Line UMC in 2013, I played the piano, sang in the adult choir, and directed the children's choirs at Greencastle Presbyterian Church for 14 years. I grew up in Williamsport, Maryland, and now reside in Falling Waters, West Virginia. My "day job" is Creative Services Director for Alpha Media. I also am a part-time actor, having been involved in numerous theatrical productions throughout the area, primarily as an actor, director or music director. I have even appeared in some national TV shows that have filmed in the area! When not working or doing something related to the performing arts, I enjoy working out, biking, hiking, watching thrillers, traveling and being on the beach. I also am addicted to "Words With Friends." I thank God every single day for the gift of music and blessing me with these talents. ​I grew up right here in the little town of State Line and have attended State Line UMC since I was an infant. My family and I are involved in the church’s youth group and other outreach activities. Starting in 2018, I will be leading our Hospitality ministry. I graduated from Greencastle-Antrim High School in 1983 and have worked for the Greencastle-Antrim School District for 11 years. Prior to that, I babysat and worked for Curves. My husband, Gary, and I have six children and two lovely granddaughters, with a little boy on the way. We spend much of our time enjoying the interests of our children and grandchildren, watching high school football games and spending time with family and friends.